As the 2010 election season draws to a close, one thing is clear: Big Labor was the biggest money spender in the 2010 campaigns. 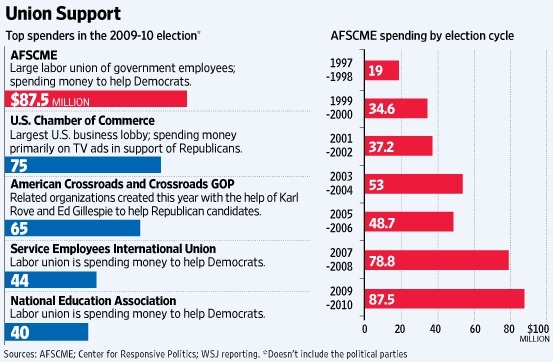 You would never know that America was in the middle of the “Great Recession” if you looked closely at what the labor unions spent on the election. Ranging from AFSCME to the SEIU, Big Labor has been a boon for left-wing campaigns. The American Federation of State, County and Municipal Employees (AFSCME) was the biggest spender of the Big Labor election players. Not only were they the biggest spender amongst labor unions, they were the biggest spenders on either side of the aisle spending nearly $88 million, according to a recent Wall Street Journal (WSJ) article. Coming in second place in the “Big Money” race amongst Big Labor was the Service Employees International Union (SEIU). The SEIU has spent nearly $44 million in this cycle. Currently, the SEIU is embroiled in scandal around the nation. One case in Nevada is especially troubling where the SEIU represents the voting machine technicians in Clark County, NV. As NetRightDaily.com first reported, the SEIU has direct control of the voting machines that are in question after several machines reportedly have ballots that are pre-marked to vote for Harry Reid — a candidate that has the backing of the SEIU itself. And that is not the end of the odd voting issues that the SEIU has found itself involved with. In Arizona, an SEIU backed group has filed thousands of fraudulent voter registrations. The group connected to the SEIU, Mi Familia Vota, filed nearly 6,000 out of 14,000 fraudulent registrations in Yuma County alone. Yuma was not the only case though, as the SEIU front also struck in Pima County. Groups like the SEIU and AFSCME are the lifeblood for the Democrats this year. While Big Labor gambles away the money of the people that they represent on political campaigns, their own pension programs are underfunded. In the public sector pension system, there is over $1 trillion in unfunded liabilities. Is Big Labor really looking out for their members or are they acting like a political party via massive political campaign donations? Unfortunately, the members of these unions whose money was wasted away are the real losers no matter what happens on Election Day. Adam Bitely is the Editor-in-Chief of NetRightDaily.com.